Pablo is a bright orange chihuahua covered in patches of brown and white. He has large, glittery purple button eyes and a black button nose on a white muzzle. The inside of Pablo’s ears are shiny purple. I like to play fetch, just toss me a stick! Pablo was released in December 2015. His Birthday is on 21st June. There are three versions of Pablo. 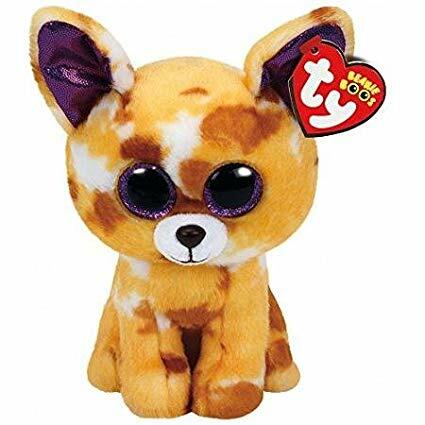 This small 6″ Beanie Boo, a medium 9″ Beanie Boo Buddy and a key clip.